We are writing to urge Puma to end its sponsorship of the Israel Football Association (IFA) due to its deep complicity in Israel’s violations of international law and Palestinian human rights. The IFA sponsors football matches in illegal Israeli settlements in the West Bank, as exposed by Human Rights Watch and other human rights organizations. There are six Israeli football clubs located in Israel’s settlements, on stolen Palestinian land, that Palestinians are not allowed to enter. Israel’s settlements contribute to serious human rights abuses and are a direct cause for restrictions on Palestinian freedom of movement, access to natural resources and ability to build homes and conduct business. IFA’s involvement in Israel’s illegal settlements has been condemned by, among others, Wilfried Lemke, the UN special adviser on sport for development and peace, dozens ofMembers of the European Parliament (MEP), civil society and human rights groups and public figures from the world of arts and culture. Despite these global appeals, the IFA has decided to put politics above sports and refused to end its complicity. As the main international sponsor of the IFA, Puma is lending its brand to cover up and whitewash Israel’s human rights abuses, including against Palestinian footballers. Palestinian players are routinely attacked, imprisoned and killed. They are denied the freedom of movement to attend their own matches. Palestinian stadiums have been bombed and destroyed. Israel even prevents Palestinians from importing football equipment and developing football facilities. 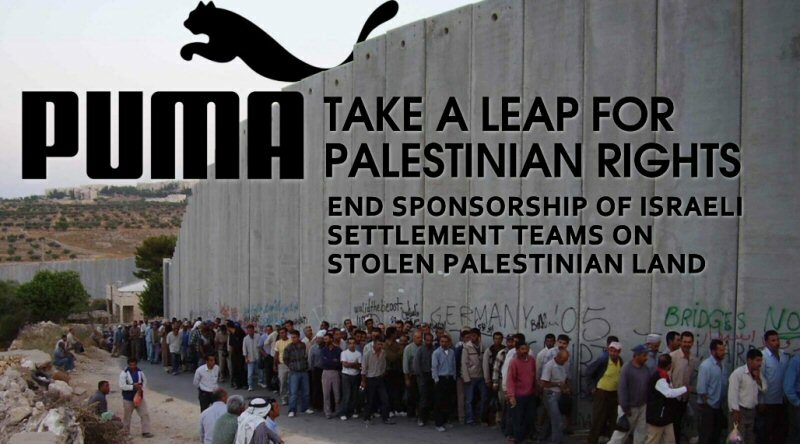 Puma’s sponsorship of the IFA legitimises and gives international cover to Israel’s illegal settlements. UN Security Council Resolution 2334 (2016) denounces Israeli settlements as “flagrant violations” of international law. The Office of the United Nations High Commissioner for Human Rights (OHCHR) is compiling a database of companies that do business in or with Israel’s illegal settlements as a practical step for accountability of complicit corporations. Puma’s sponsorship of the IFA would land it on this list based on the selection criteria. In addition, your sponsorship of the IFA, an entity with operations in the settlements, makes Puma complicit and may expose it to consumer-led boycott campaigns in the Arab world and globally. According to your Code of Ethics, Puma is committed “to human rights and intend[s] to act as a socially responsible company” wherever it operates. We urge you to abide by your Code of Ethics by withdrawing your sponsorship of the Israel Football Association (IFA) until it ends its involvement in Israel’s grave violations of international law and human rights abuses against Palestinians.